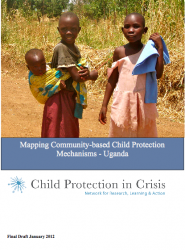 This research took a bottom-up approach in examining existing Community-Based Child Protection Mechanisms (CBCPMs) in Arua and Nebbi districts in Uganda. This research utilized an amended Community Mapping approach to explore community perceptions and experiences of child protection across eight sites. It addresses the different threats and sources of harm that community members and leaders believe affect the safety and wellbeing of their children, and how those challenges are prevented and addressed. Participants most frequently mentioned neglect or lack of parental care, child labour, early pregnancy, marriage, and sexual and physical abuse.